A good turn out in Siomon's Town and perfect winter weather. From the beach, the three groups headed up through the historic part of Simon's Town to Just Nuisance's grave via the old cable way. 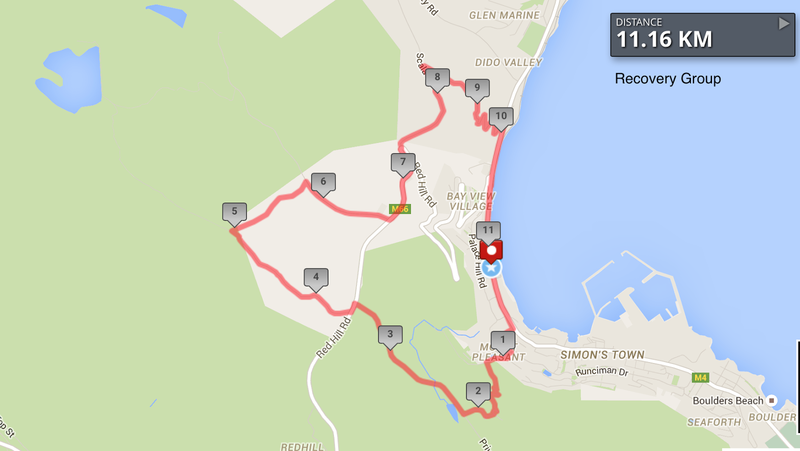 We then followed the road across Red Hill road towards Kleinplaas dam. 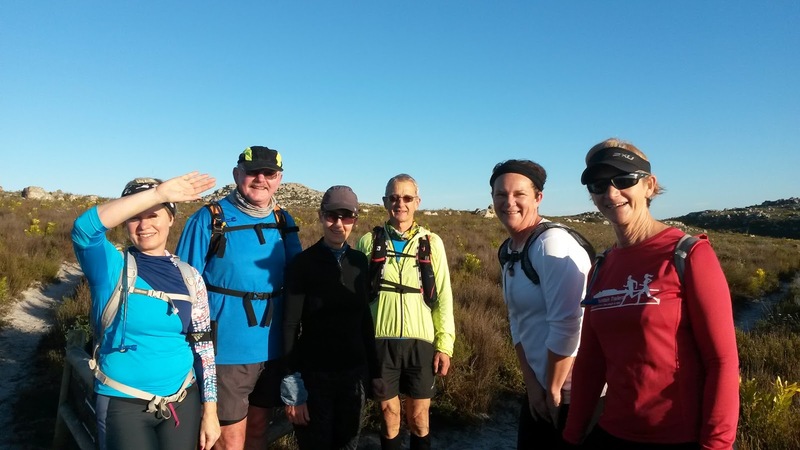 The Main group went all the way to the dam, the Recovery group turned just before the dam and the the Walk/Run group bypassed the off-road section. From there, we continued down Red Hill road toward the old Scala barracks. The concrete road lead pas the old WW2 9.2 inch guns and the recently renovated cannons down to the main road. From here we headed along the beach back to the cars. 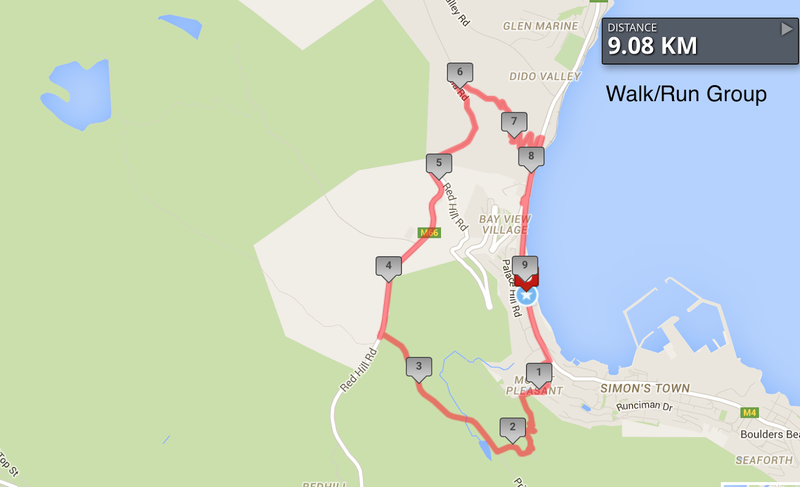 All three groups came in at 2hrs and their respective routes are shown below. We had a fabulous turnout this week with 20 trailers in the main group, 7 in the recovery group and our usual team of intrepid run/walkers setting off at the start. The steep climb to the turnstile below the blockhouse was a good wake up call and elicited many a moan and groan. The next few kilometers however were gentler, and I think I was forgiven for the rude awakening! The path meanders in and out as it follows the contour of the mountain with small boulders on the surface in many stretches causing slow going. The boardwalks were super slippery and unfortunately we had a casualty as a new member took a hard fall. At a point soon after the end of the boardwalks, the main group lost a few members as time constraints pressed, but not before we took the group photo and had a short rest. 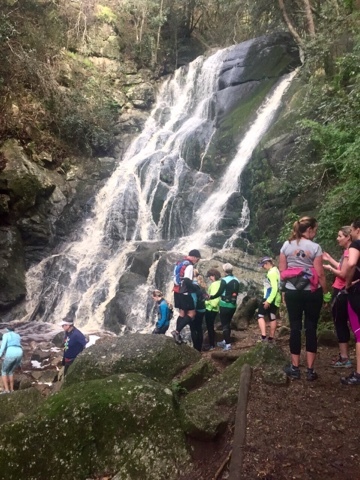 Next, we clambered over the rockfall (which I learned has a name - Dassieklip - and the area/hill is called the Aloes) and then descended into the deep, dark forest, and continued on to the majestic waterfall at Skeleton Gorge. Here there was some debate about the rest of the route, but we pressed on as somewhat vaguely planned, rock-hopping over the water without getting our feet wet. We had done over 6km and so headed down towards Newlands Forest in the general direction of Rhodes Mem, albeit in an 'all roads lead to Rome' sort of way. Fortunately both Alex and Theo know the forest well and led the way. Sadly, our injured member was struggling and so we left him at Newlands Fire Base to be rescued by the gallant Alex in his trusty four-wheeled vehicle. There was some dissatisfaction at one point over the apparent need to climb back UP a set of steep steps and the leaders attempted to cut a new track through the forest instead, but were foiled after just a few meters. There was no way but UP! We soldiered on, and eventually arrived at the jeep track which was straightforward if not completely flat. By the end of the run, we had separated into about 5 distinct groups, but despite all the morphing and splitting along the way, all trailers were safely accounted for. 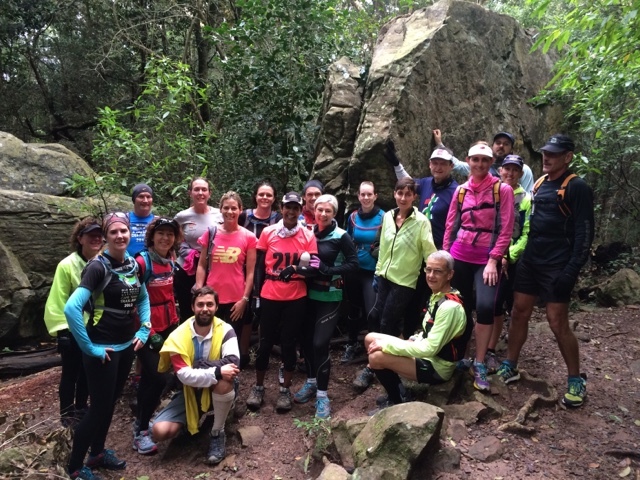 The main group did a whopping 14.5 kms in a time ranging from 2.5 to 3 hours; the recovery group did the full distance (climbing right back up to the top contour path) in 3.5 hours; the run/walk group did an amazing 11.5 kms. GPS devices in both main and recovery groups recorded a total ascent of 1000 meters! All in all a gorgeous morning with wonderful company and beautifully varied surroundings. Hearty congratulations to Nicole Meyer who celebrated her 50th sortie with the Trailers! Photos courtesy of Angela and Jo. 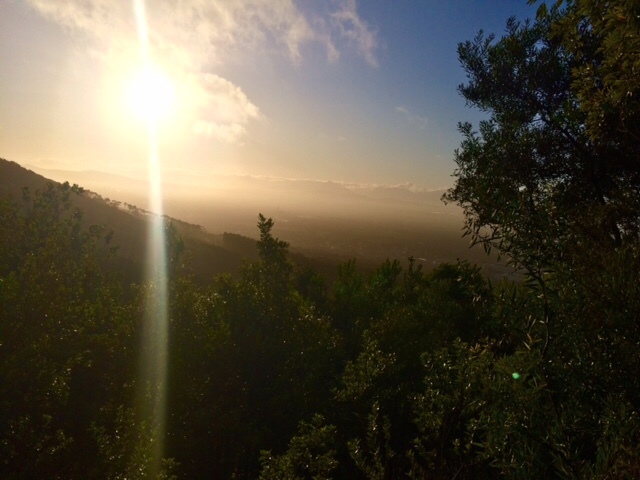 A surprisingly clear day for a run after all the rain in the preceding days. Just a small group of runners, with two new runners in the Main group. The Main group went with the original plan up the Hoerikwagga trail to Eagle's nest corner and then the trail past Belle Ombre to the De Villiers Dam. 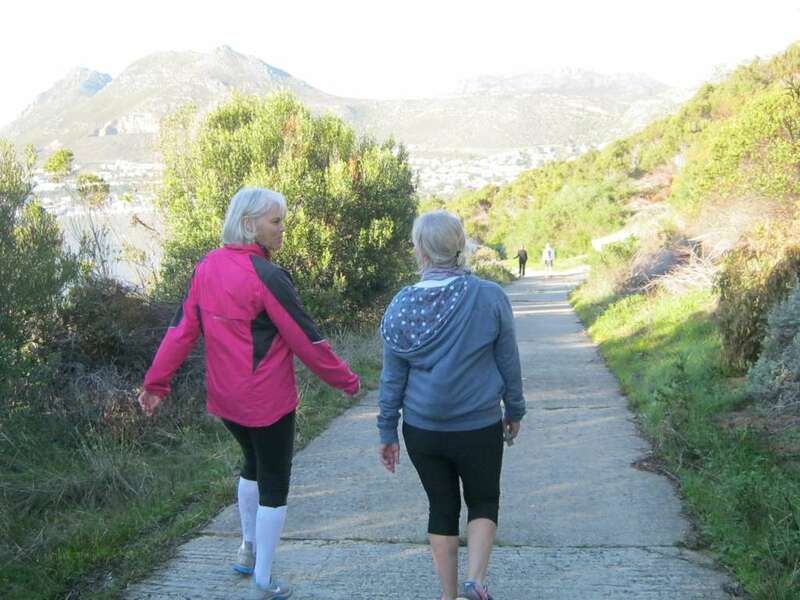 From here, they went along Smuts Track to the top of Nursery Ravine, and descended into Kirstenbosh before returning along the trail above the dam and following the tracks through Cecelia forest. The Main group: Hannah, Hein, Kim, Katy and Geoff taking the photograph. 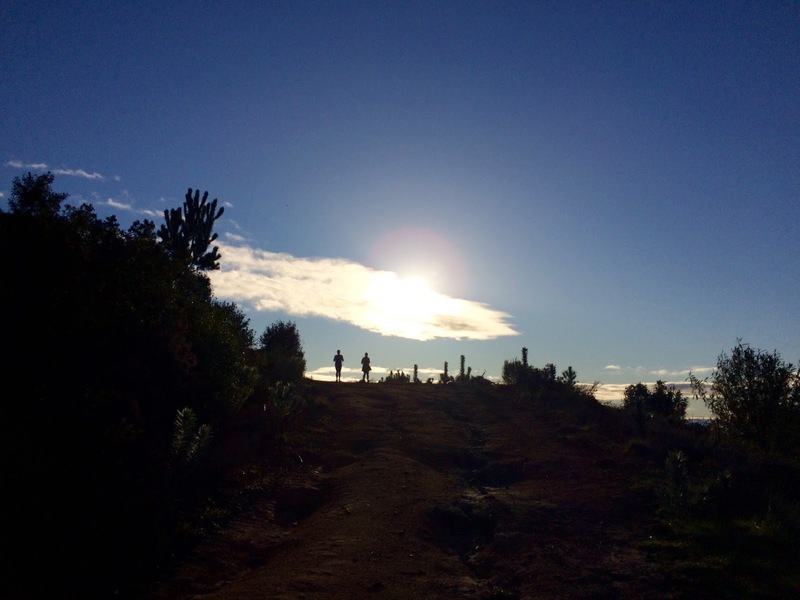 The Recovery group opted to follow a more undulating route, that not only cut out the exposed trail, but also managed to stay below the clouds on the upper parts of the mountain. Their route stayed along the upper contour path to Skeleton gorge, where we decided to turn back because of the fast flowing river (pictured below). We returned via the lower contour path through Cecelia forest (pictures below). 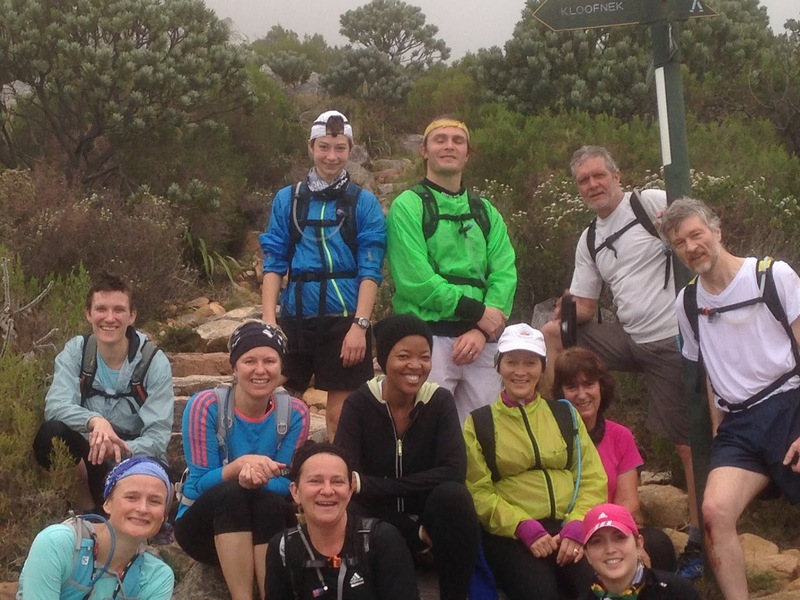 The Recovery group at the base of Skeleton Gorge. 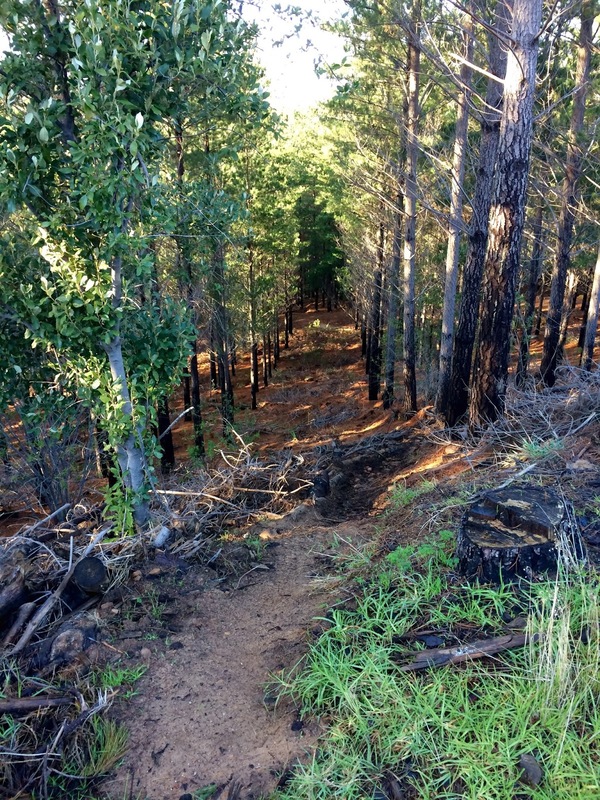 Tree-lined trails in Cecelia forest. A cold but beautiful morning out on the mountain. Both groups set off along the Pipe Track, with the Main group going up via Corridor Ravine and the Recovery group going up Woody Ravine. 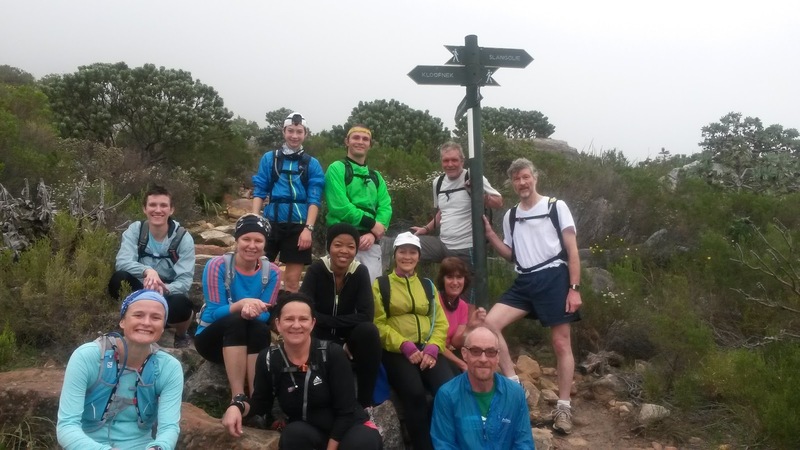 Both groups met up on their way down Kasteel's Poort. In total, we ran for about 3hrs, but luckily the rain held out until we got home. At its best, a route name hints at the nature of the route, or encapsulates the story of its opening ascent, or makes reference to a prominent feature found along the way; at its worst, it describes the route's principal physical feature in unflattering or prosaic terms. An example of the former is Desperation Corner, a climbing route opened in 1938: the name evokes images of anxious cragsmen battling up forbidding cliffs. An example of the latter is Pimple Ridge, an old climbing route on the Twelve Apostles that tops out on a prominent little peak named Pimple Peak – which happens to be one of the most beautiful places on Table Mountain. Early route names were matter-of-fact, stating the name of the buttress on which the route was opened, followed by the dominant feature of the climb (sometimes random); so you get Grootkop Wall, Fernwood Gully, Platteklip Face, Africa Nose, India Waterfall, Ascension Ravine, Cairn Ridge, Fountain Crack, Blinkwater Cleft, Porcupine Arete, Spring Needle, Barrier Edge, Corridor Rib, Kleinkop Recess, etc. 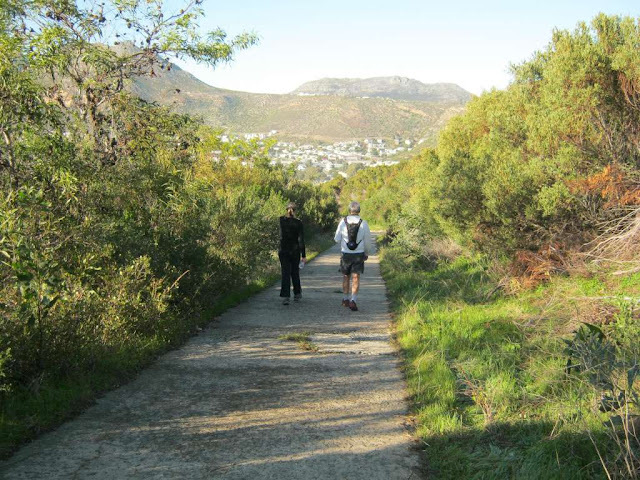 In the 1910s, when Table Mountain's most prominent buttresses became the focal point of climbing activity, route names simply took the name of the buttress; examples include Fountain Buttress, Jubilee Buttress, Fernwood Buttress, etc. The name of the first route on a buttress – usually up its center, as was the way in the early days of mountaineering – would typically be appended with 'Frontal': some of the more well-known ones include Slangolie Frontal, Barrier Frontal and Corridor Frontal. Platteklip Gorge: The most popular hiking route on Table Mountain. Formerly Platklip Gorge, of Dutch origin, translates to Flat Rock Gorge. Named after an embedded slab of granite low down in the gorge. India Venster: The route crosses India Ravine (shaped like the country India). 'Venster' is Afrikaans and Dutch for 'window', and refers to a gap along the route formed by a chockstone that resembles a window. 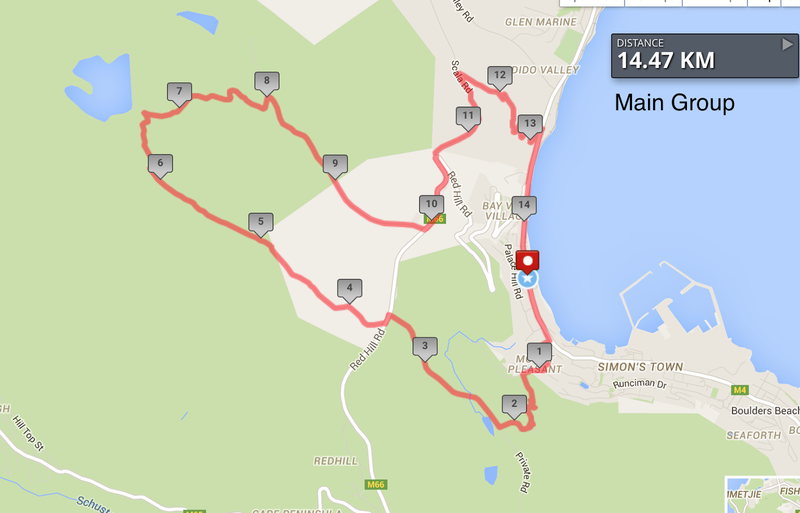 Kasteelspoort: The most popular hiking route on the Twelve Apostles, up the west side of Table Mountain. 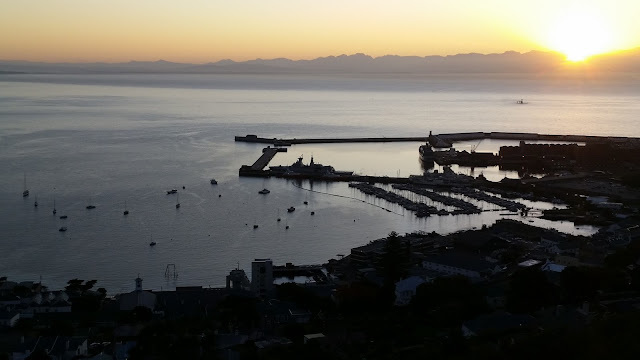 Of Dutch origin, translates to Castle's Portal, a broad, open ravine that offers easy access up the Twelve Apostles, formerly known by the Dutch settlers as the Kasteelberge – Castle Mountains. 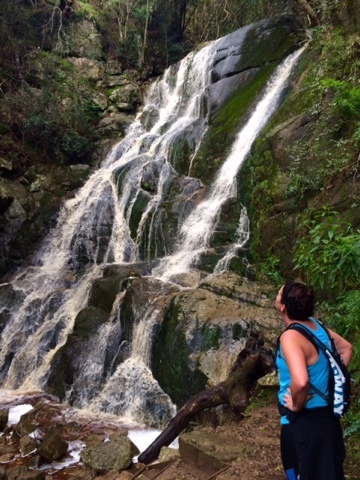 Slangolie Ravine: Afrikaans word that translates to Snake Oil Ravine, but not the intended meaning. Actually derived from Slang (Snake) Gully, pronounced by Welshmen in the late 1800s as Slang Goolie, and eventually stuck as Slangolie. Not used as a route anymore, after a rockslide in the 1950s left the ravine bed dangerously unstable. Nursery Ravine: named after a 1880s tree nursery on the mountain above the ravine. 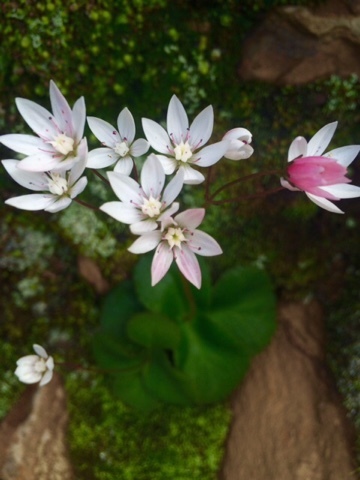 Skeleton Gorge: The most popular hiking route up the east side of Table Mountain. Origin unknown, but one can only assume that a human skeleton was found in the ravine sometime after the 1850s, when routes names for routes other than Platteklip Gorge became popular. Left Face 'B': Platteklip Gorge, a deep gash up the front of Table Mountain, divides the face of the mountain into two sections: the Left Face and the Right Face. This route is one of the first routes up the Left Face and therefore takes the name from its location on the mountain. To distinguish it from another very old climb in the vicinity known simply as Left Face (a climbing route), the route's grade, 'B', was added to the name. Nowadays, some refer to it as 'Mystery B' because of a secluded gully that is a key feature of the route. Cairn Ravine: Takes its name from a cairn (small rock pile that serves as a beacon to indicate a route) that was built near the top of the ravine to mark the spot where the bones of a missing climber was found in the early 1900s. 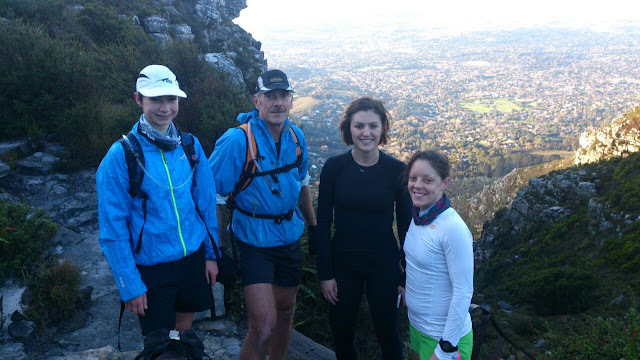 Kloof Buttress Arete: A route name consisting of three nouns, each describing a mountain feature. 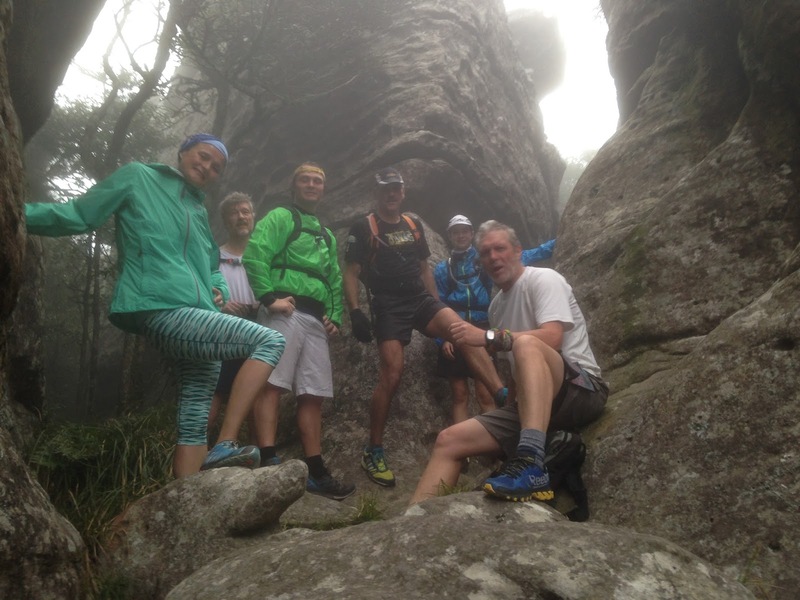 The route – a very obscure one rarely done nowadays – follows an arête (a narrow, sharp-crested ridge or corner) along the side of Kloof Buttress. 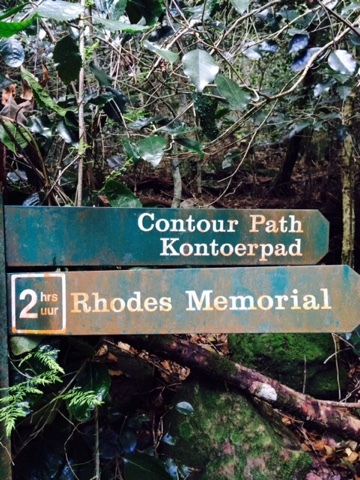 'Kloof' is Afrikaans and old Dutch for 'gorge' or 'ravine'. The buttress takes its name from its location above the 'kloof' that separates Lion's Head and Table Mountain. Deception Face: A climbing route opened in 1925, apparently named so after the pioneering party anticipated greater difficulties than those which they encountered. 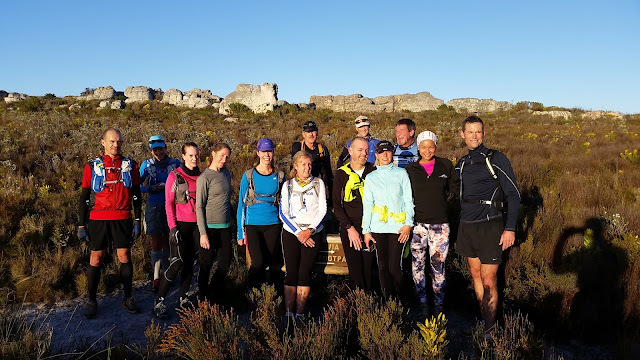 New climbing routes are still added to the Table Mountain route list, which now includes more than 900 routes (climbing and hiking routes combined; and depending on your definition of a route – a contentious issue). Nowadays, route names often spring from witticism and humour, as most of the prominent features of the mountain have been climbed. Whichever route you take to hike or climb Table Mountain, it adds something to the experience to know the origin of the route's name. 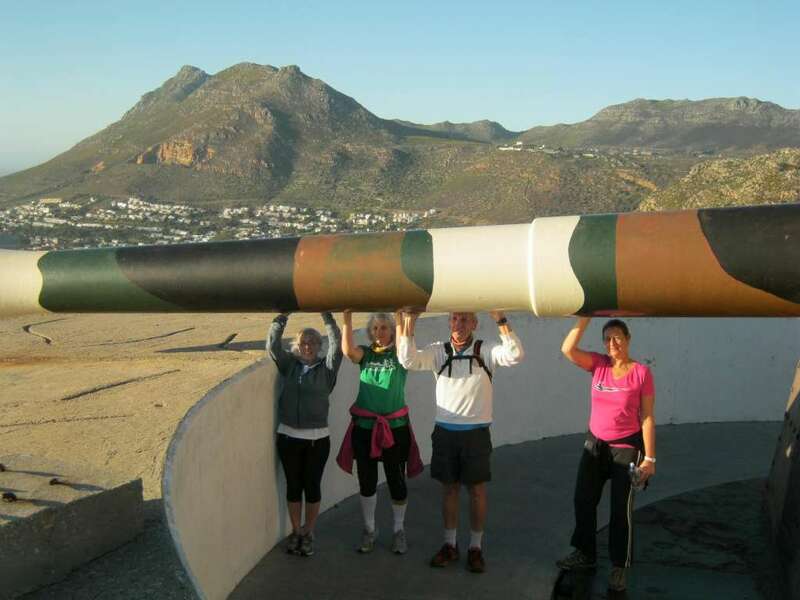 Hiking and climbing on Table Mountain is steeped in history, and forms an integral part of knowing Table Mountain.